The Netherlands Antilles was formally dissolved in October 2010. 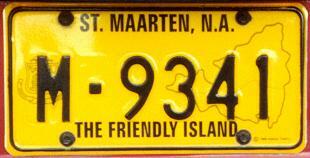 New plates are issued by each of the islands, some annually. M-9341 St Maarten normal series since the 1940s (originally with less than four numerals). 1999-2003 plate style. 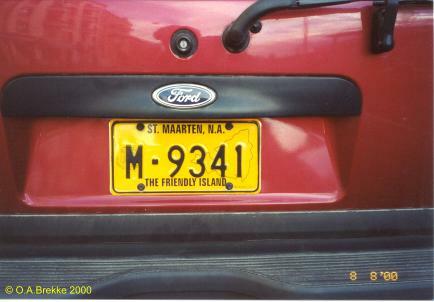 M = St Maarten, private cars. of the island with the border between the French and Dutch parts barely visible.